April 2016 - Wheres My Keyboard? 1. 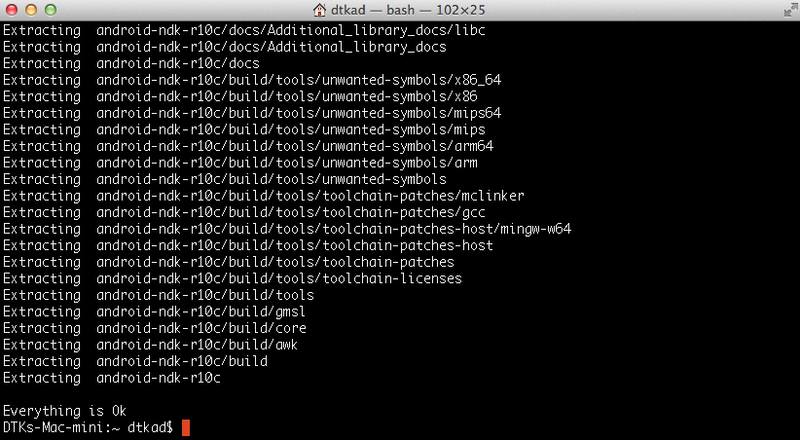 When you to open “android-ndk-r10c-darwin-x86_64.bin” with “Archive Utility.app” or other app. 2. 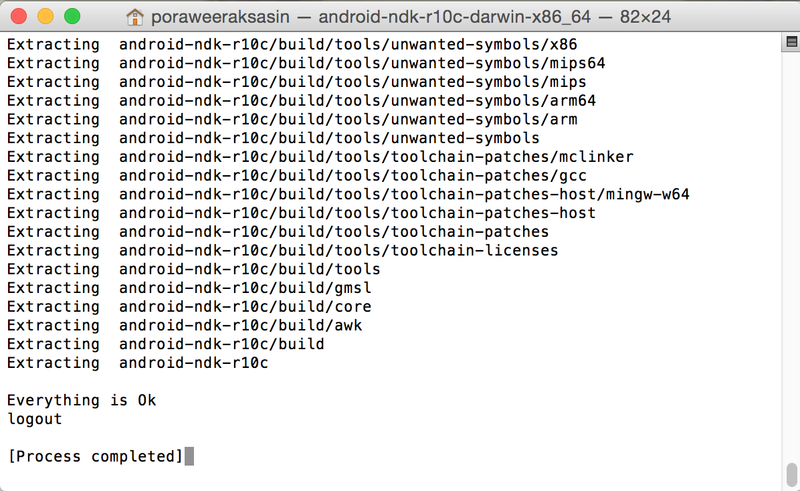 Then you’ve got “android-ndk-r10c-darwin-x86_64.bin.cpgz”, OH! Crap it’s not extract but archive .bin to .cpgz extension. 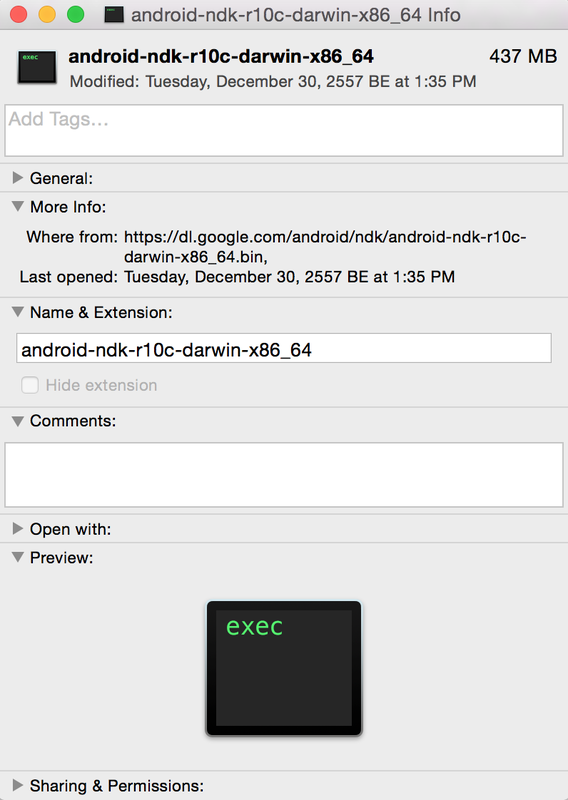 1. open Terminal then type “chmod +x [path]/android-ndk-r10c-darwin-x86_64.bin” and press “Enter”, after that type only “[path]/android-ndk-r10c-darwin-x86_64.bin” and press “Enter” as below image. After that Terminal was extract with 7-Zip SFX, as below detail. 1. It’s too easy just rename by remove “.bin” if your non-extension file can be execute. you should see it’s as execute file, check it by right-click and choose “Get Info”, you will see detail like below image. 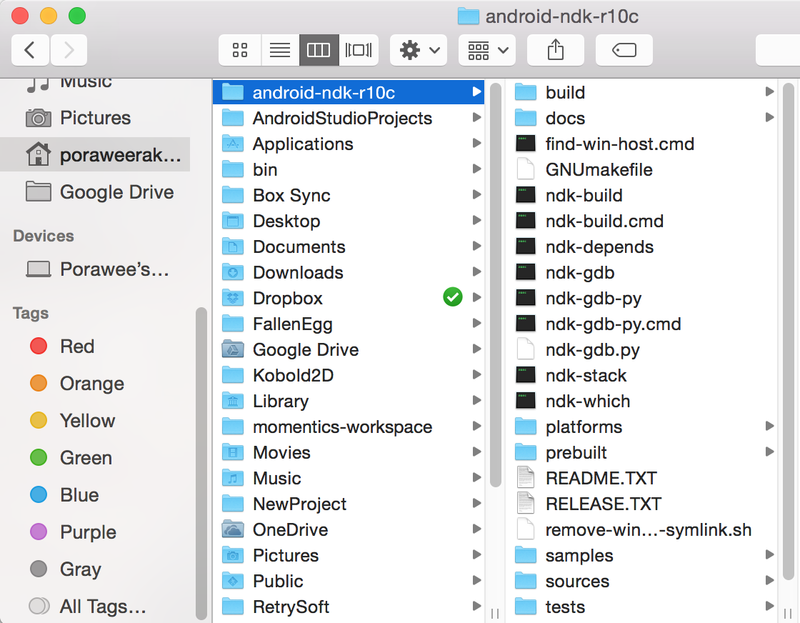 2. double click on “android-ndk-r10c-darwin-x86_64” execute file or open with “Archive Utility.app”, so if you not see “Archive Utility.app” in both Launchpad and Application folder, it should be here “/System/Library/CoreServices” like below image. then the Terminal was run and execute file will do extract process, leave it run until it’s show message as below. 3. 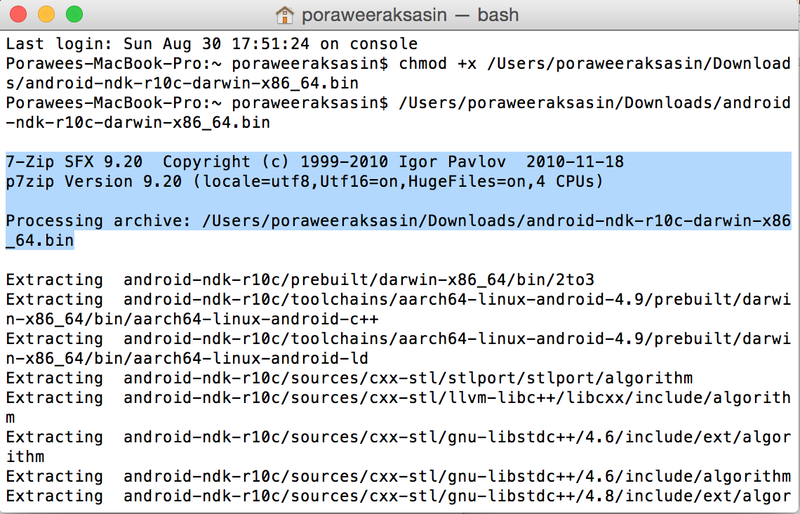 Let’s see your extracted folder “android-ndk-r10c”, it’s contain in “Users” by default, for example my users is “poraweeraksasin” from step 2. name on bar, see below image. This one line of fix is enough and will work a 100% for you. Just try starting Fiddler before starting your application. This helps the default configuration, whereby .NET applications pick up the system proxy when they start and are oblivious to proxy changes after they start. Cards Layout in Xamarin.Forms – Never have Xamarin Forms looked so cool! All credits to the original author for doing this. Although I’m trying to extend it in the coming days, but props to Adam for finding this one out! Go to https://www.syntaxismyui.com/xamarin-forms-in-anger-cards/ and follow his other tutorial as well. The #1 request I get for the Xamarin.Forms in Anger is for a Google or Facebook like card view. Today is the day that I fulfill those requests. To be completely honest, I’ve been thinking about how to do a card view for a while and let me tell you, it’s not easy. Especially when you try to stick with the “in the box” components of Xamarin.Forms. My first attempt at it was hideous. Hideous would be the most polite way of saying it was crap. I started off using BoxViews to draw the lines and contain the whole thing in a Xamarin.Forms Grid. Ouch, yes hideous. With the BoxViews not working out, I went to lunch to clear my head and to think. I love lunch and I don’t miss a meal. That day, I decided to go to Chick Fil A and get a chicken sandwich with a side of epiphany fries. There I was, eating my chicken and dunking my fries in ketchup (Sauce de American). When I dipped a waffle fry into the ketchup, the ketchup squeezed through the holes and made a red checkerboard on top of the fry. Then it hit me. Bam! I was going about the card UI backwards or forwards. Either way, it was the wrong way. I had to do an about face and approach it in another way. The way the ketchup came up through the fry not by putting ketchup onto the fry. As soon as I got home, I worked up a Xamarin.Forms Grid with some padding, row and column spacing. In addition to those settings, I also set the background color of the grid to a medium dark grey. Then added ContentViews with white backgrounds into each cell of the Grid. This is what it looked like when I finished. The white panels acted like the ketchup on my waffle fries and the borders are the potato. Yes, I know, it’s strange to describe Xamarin.Forms design techniques using food, but stay with me; it gets better. Now that I knew the technique worked and was a heck of a lot less messy, I pushed on. Each CardView is made up of 5 ContentViews with a background color set to the designed color. Here are some of the background colors for each panel. 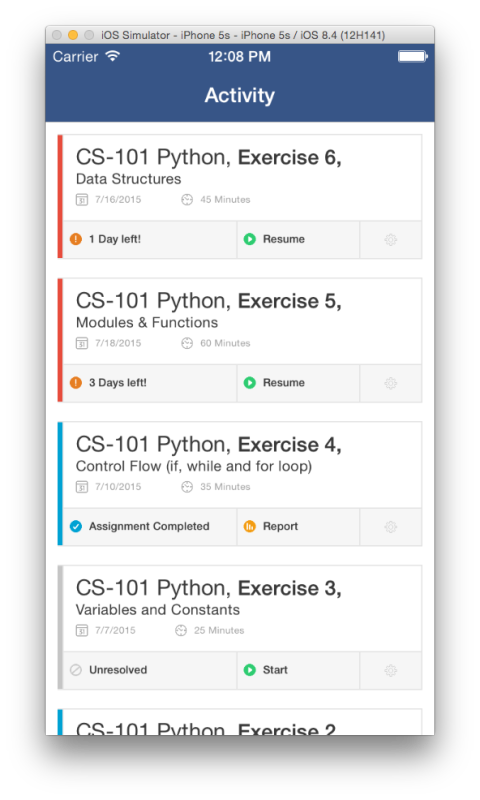 The CardView.cs file would have been gigantic if I kept all the code in the same file so I broke it up into different ContentViews. Here are the names for each ContentView that makes up the CardView. The CardDetailsView has a column span of three to horizontally bridge the two IconLableViews and the ConfigIconView. The CardStatusView has a row span of two to complete the vertical lefthand status bar. For the demo, I put a couple of CardViews in a vertical StackLayout. If I had a lot of cards, I would prefer to use a ListView. Hopefully a reader will let me know how well this design works in a ListView. It should be ok, especially while using the Grid and not a bunch of nested StackLayouts. I’ve learned my lesson. With all the refactoring; the CardView looks small and plain but the devil is in the ContentViews. The code for this sample is up on GitHub in the “In Anger” repository. For this post, I broke the code out into a separate directory and solution to make it easier for you to reuse the CardView without getting confused with all the other code and resources from other posts. Who knew that a humble waffle fry would be the answer to the Xamarin.Forms CardView? Not me; I go for the chicken. Don’t you worry dear read, I will continue to go to “Chick Fil a” to get more Xamarin.Forms design inspiration in the future. Stay tuned to this blog and, if you have a design challenge, just put it in the comments below or email me at adam [at] adamjwolf dot com. Can Xamarin.Forms produce good looking cross-platform UI from a single codebase? Each “In Anger” blog post will tackle a single page of a beautifully designed iOS or Android application. My job will be to reproduce the design in Xamarin.Forms as faithfully as possible. cheapest wifi card for hackintosh laptop …… EVER… Less than 7$. Free international shipping. So, Lot of people like me have a hackintosh all ready and set up and are usually missing just one very critical component of Hackintosh, that is, WIFI. It is the chipset BCM94322HM8L. You can get it from amazon for less that 7$!!!! Now, if this becomes out of stock or becomes costlier, ping me I’ll help you get it for less that 7$. Shipping inclusive. You can also google search the fore mentioned chipset, I’m sure you’ll get ton of results as well. And what’s the cherry on the cake? No KEXTS required.!!! yes, It works out of the box. So what are you waiting for??? Step. 5: Wait to Complete process. After complete process close Remix OS USB Tool. Step. 1: Now Shutdown your PC/Laptop and Turn on using Boot Menu Key. There you can select Remix OS. After select Remix OS it will show Guest Mode and Resident Mode.